I consider myself somewhat of a geek and did so long before it was in vogue, but I have never been interested in science fiction at all. I enjoy more artistic, somewhat surreal fare. So while I know the re-imagining of the Battlestar Galactica series was much acclaimed and hailed as high achievement, in not only science fiction but also drama as an epic space opera, I was not all that compelled to watch. I kept hearing about its dramatic themes about war, terrorism, humanity, and religion, but I could never get into it. I thought the show lacked a certain flair or quality for my taste. At a co-worker's insistence, I very slowly watched the first season. It took me months just to get through the mini-series that started off the show. I do, however, like my t-shirt. And while I can appreciate the great writing and character development and cannot deny the superb storytelling, there are a few flaws about Battlestar Galactica, I simply cannot never get over. Everybody in the series looks, acts, dresses, and talks more or less like twenty-first century North Americans except in space, which I found endlessly distracting. This quality gets worse in Caprica as it takes place not in space but on an Earth-like planet. Women wear dresses; men were suits and ties. Everyone speaks western English, despite being from different planets and worlds entirely. There is no greater space mythology akin to Star Trek (another show I never watched). Now I understand this lack of world-building was mainly due to budget constraints for the science fiction show. To create a whole new human-based society from scratch a la Star Wars would be greatly expensive for the Vancouver shot show, but I found their explanation of a human consciousness that recreates a similar culture and society throughout history a little lame. A single culture on an Earth-like planet, much less across solar systems feels odd to me. Forgive my over critical eye. Also, I cannot stand the constant use of the made up profanity, "frak". It find its use forced and overdone. Anyways, when I heard there would be a spin-off based on the show set 58 years before the events of Battlestar Galactica, not centred in space but on family drama instead, I was intrigued. What I like about the Syfy series, is the social commentary on our society, despite its overt and obvious themes. Caprica is set in an ultra-liberal, polytheist society where open-mindedness, vices, and hyper sexuality is widely accepted. However, racism and prejudice is overt and out in the open instead of hidden or repressed. Capricans accept plural marriage, homosexuality and such as openly and tolerantly. But with this, there is great strife. Caprican society worships multiple Gods (a la ancient Greece) in an almost secular way as monotheists in society are feared and treated as radicals and terrorists. The very idea of believing in a single, all-knowing, all-powerful entity is considered very dangerous and irresponsible. Caprica is a world somewhat opposite of ours with reverse persecution. I find the commentary very intelligent. It is a very different show than its predecessor and you can see how the liberal themes and dangers (analagous to modern European war) lead into the more militaristic, conservative commentary in Battlestar Galactica (akin to contemporary American war). Parts of the show still bug me. The fact that humans exist in our exact forms from living on different planets but share our ethnic differences on Earth is strange, especially when Battlestar Galactica integrated itself into our own timeline with its finale. How rich people in Caprica also play tennis or the fact that I recognize all the local landmarks in Vancouver or at UBC standing in as a far away planet takes me out of the show. Capricans even smoke cigarettes and drive the same cars we do, but I digress. Caprica does succeed in building upon a world not unlike our own as a different way of commenting on human nature, behaviour, and society. That said, beyond the suspension of disbelief and buying into the deep mythology of Caprica, it is a very slickly-produced political and family drama that delves into the nature of life and humanity. It has a promising premise and delivers excellent storytelling. The acting by the leads, Eric Stoltz and Esai Morales, is very solid as the heads of the Graystone and Adama families. So far, the extended pilot and second episode have moved slowly and someone not familiar with the Battlestar Galactica world would be hard pressed to fully grip the reality created. Producer Ronald D. Moore and crew have molded a new, familiar, gripping dramatic arc within a science fiction, fantasy world which is compelling and powerful but somewhat confusing and not entirely focused. 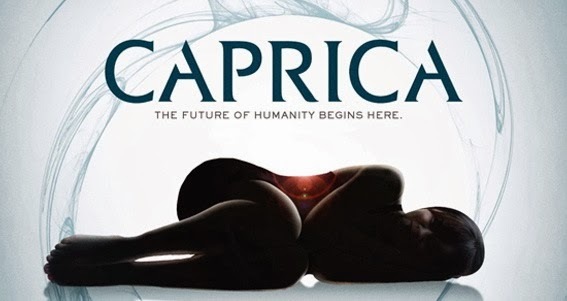 I look forward to what Caprica brings next and learning the human story of how Cybernetic Lifeform Nodes or Cylons were created with the mind of a teenage girl. I hope the mixture of melodrama and killer robots strikes a better balance in order to give a compelling viewing experience. "It doesn't concern you, sister? That kind of absolutest view of the universe?.. Right and wrong determined solely by a single, all knowing, all powerful being whose judgment cannot be questioned and in whose name the most horrendous of acts can be sanctioned without appeal?"